BEVERLY HILLS, CA--(Marketwired - April 25, 2017) - Genius Brands International, Inc. "Genius Brands" (NASDAQ: GNUS), a leading media company that creates, produces and licenses children's multimedia entertainment content and products for global broadcast, digital and retail distribution, has licensed exclusive U.S. and Caribbean Basin broadcast rights for season one of its new CGI-animated production, Rainbow Rangers, to the No. 1 rated kids' network, Nickelodeon. Currently in development (52 x 11' episodes), the mission-based action adventure series is expected to air on Nickelodeon's preschool channel, Nick Jr. The deal follows Genius Brands' recent announcement of the appointment of Mattel Inc.'s Fisher-Price Toys as Global Master Toy Partner for the brand, further demonstrating the high level of confidence that the property is well positioned for breakout success in the global market. Rainbow Rangers, which is expected to air on Nickelodeon's preschool channel Nick Jr., boasts a unique and highly-accomplished team of creators from the animated motion picture world, including Rob Minkoff (Disney's The Lion King director), Shane Morris (Disney's Frozen co-writer), Tim Mansfield and New York Times Bestselling author and Emmy-nominated writer Elise Allen (Dinosaur Train, Lion Guard, Barbie specials) who is serving as head writer and co-creator. Genius Brands' Chairman and CEO and multiple Emmy-winning producer of more than 5,000 episodes of children's programming, Andy Heyward, serves as executive producer, with legendary Disney alum Ruben Aquino creating key designs. Aquino is responsible for the design and animation of many of Disney's most iconic characters from award-winning films including "The Lion King," "Beauty and the Beast," "The Little Mermaid," "Mulan" and "Frozen." "We've assembled an unprecedented team of creative talent to bring Rainbow Rangers to life and are committed to selecting partners of the same caliber that have a shared passion for the brand," said Heyward. "Nickelodeon has introduced so many of the most beloved and exciting characters to kids and families across the globe." Rainbow Rangers is an empowering, exciting, behind-the-curtain peek at the real lives of superheroes -- Earth's First Responders. The series seamlessly blends fantasy and action-adventure with relatable, accessible stories about friendship and saving the environment. 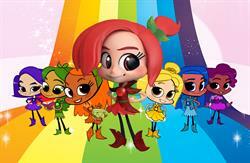 The Rainbow Rangers -- seven girls, each a different color of the rainbow, each with her own wildly unique personality and powers -- band together to save the day whenever there's trouble for the people, animals or natural wonders of the Earth. Every storyline is designed to show viewers the importance of working together and that actions both big and small can make the world a better place. As a flagship property for Genius Brands in its strategy to build global properties, the new animated series has received strong interest from broadcast and licensing partners since its debut at MIPJunior in Cannes last October. Fisher-Price, the world leader in the preschool category, will lead the licensing and merchandising program with a broad range of preschool products in the toy category. "Rainbow Rangers is an exciting content series that we believe will strike a relevant cord with its mission-based adventures and message of empowerment for preschool girls," said Susie Lecker, EVP & Chief Brand Officer, Mattel's Toy Box. "Bringing Rainbow Rangers to life through engaging product allows us to address the opportunity in the preschool toy aisle for a girl-targeted, heroic, action-focused line. We're looking forward to the continued collaboration with Genius Brands and the incredible pedigree of talent behind the development of the series, to realize the full potential of a compelling toy line." Genius Brands is actively developing its global merchandising, licensing and retail program across all key categories to coincide with the series launch. "Combining Genius Brands' unique business model and expertise in creating highly engaging cross-platform content with Nickelodeon and Mattel's pedigree and industry-leading position in the global market gives Rainbow Rangers the fuel it needs to lead in the preschool space," said Stone Newman, President of Global Consumer Products, Worldwide Content Sales & Marketing. "Our partnerships can be seen as indicators of the growth potential for this property and its ability to generate significant revenue streams across multiple categories." Genius Brands International's (GNUS) Rainbow Rangers, which will air on Nickelodeon's preschool channel Nick Jr., boasts a dream team of creators, including Rob Minkoff (Disney's The Lion King director), Shane Morris (Disney's Frozen co-writer), Tim Mansfield and New York Times Bestselling author and Emmy-nominated writer Elise Allen (Dinosaur Train, Lion Guard) who is serving as head writer and co-creator. Genius Brands' Chairman and CEO and Emmy Award-winning producer Andy Heyward, serves as executive producer, with legendary Disney alum Ruben Aquino (Frozen, The Lion King) creating key designs. Mattel's Fisher-Price Toys is onboard as Global Master Toy Partner.